Ani-mayhem is a great game to play with friends but now a days you will most likely find your self playing solo. This isn’t necessarily a bad thing. Solo play allows you to come up with a lot of unique ways to play or the ability to experience and anime story line. I think this is part of the true beauty of Ani-Mayhem. In this article I will give you a basic overview of a fun solo game idea I have created. You can play this with other people, but it works much better when played alone. This game idea is Great Ape Hunting. In this game type you will hunt and search for the Dragon Ball Z great apes. The main goal is to kill as many as you can. So instead of collecting items for the win you want to rack up great ape kills. When ever you defeat a great ape (not his regular Saiyan form) put him off to the side in a pile for your kills. If you get them all, then congrats, if not keep trying to beat your high score! I am not going to type out a whole deck list for you because like I mentioned solo play is where it is fun to experiment. I will however give you a list of recommended cards to get you started. First off I would suggest you play a standard size deck with at least some DBZ characters in your party because things might get rough quick. Also I would put in some very good Flash Effects, however, don’t use Wrath of the Eye of God. It is just too easy, your supposed to be enjoying the hunt. Here are some recommendations, play them at 3 each for consistency if you wish. Use Baby Gohan in your party for an extra ape whenever you want a greater challenge or more game to hunt. Raditz, Nappa, and Vegeta. These are the main Disasters in the deck because they are the big boys, especially Vegeta. Play him at 3 at your own risk, you could become the hunted. Baby Saiyan is another ape you can play to add more to the hunt. 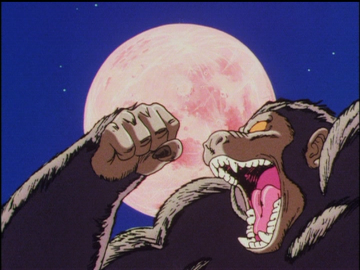 Full Moon is needed to get the Saiyans to transform. False Moon can be used like Full Moon but it gives you more control over when they transform, plus you don’t wanna wait forever for a Full Moon to appear. Moon Destruction can be used if you feel you may run into trouble and need to chill for a few Turns. Impending Doom can be used for more consistency getting you those great apes quicker. Will Power can be used to recycle any Saiyans who were killed in their non-ape forms. Lastly, be sure to add Flash Effects that give you more Attack & Defense and can heal your party. Use easy to access Locations because you want your Items to help you defeat more Saiyans. The rest is up to you! I hope you have fun and see you on the hunt! Save your high score and send me a message sometime, I would love to see how far you got!